Damn Fine Words is a 10-week, 20-lesson writing course designed to teach you effective writing skills through proven techniques, providing you with a wash, rinse, repeat process that works for any type of content you want to write. This course is different: It’s designed to help you become a better, faster writer who can create all kinds of content for your business, whether you’re a new writer or a seasoned pro. You’ll see tangible results, like increased sales, new clients, and more readers. And you’ll boost your confidence and stop stressing over whether your writing is good enough – you’ll know it is. Damn Fine Words could change everything – your writing, your business… maybe even your life. 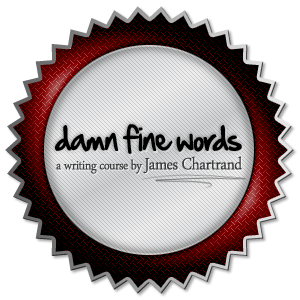 Registration for Damn Fine Words opens to new students on February 6, 2017. This course works, and hundreds of past students have seen tangible results – take a look at what they’ve said about their experience. They’d learn how to write better, more engaging website content that draws in much-needed revenue. They’d stop struggling with what to write and know how to create good content that brings them results. They’d boost their confidence and feel excited about writing instead of agonizing over every word. I want to help make that change happen. The Damn Fine Words writing contest is open to anyone – writers-for-hire, freelancers, small business owners, the self-employed, and entrepreneurs, in any career field or type of industry. This contest isn’t about the quality of your writing – that won’t be judged. You can enter whether your writing skills are at the beginner, middle or advanced level. English doesn’t have to be your first language, as long as you write fairly well. Your sincerity, desire to learn, and motivation to succeed counts more than anything, because this writing contest is about the quality of your determination – about what you would do, and how you would change your life, if you had better writing skills. Should you enter the Damn Fine Words writing contest? It depends. If you currently write content for your business and would love to be a better, faster writer, then yes, you should enter. If you’re planning to start a new business this year, then yes, you should enter. If you’re stuck in a rut and want something to give you a boost, then yes, you should enter. If you’ve just started your business and want to generate good results, then yes, you should enter. The winner will receive a full scholarship to the February 2017 session of the Damn Fine Words writing course (retail value $1,399). One runner-up will receive a 50% scholarship applicable to their registration for the February 2017 session (retail value $799). Class begins February 20 and runs for 10 full weeks. The winner and runner-up will become full-access students and directly benefit from the course lessons, hands-on exercises, immediately applicable advice, and interactive members-only area. They’ll also get access to my personal support, writing coach mentorship, and feedback on your work throughout the entire course. I’m right there with my students for the full 10 weeks, answering questions, sharing my knowledge, and helping people like you become a better writer. Want more details about Damn Fine Words? Get them here. Write an article or a blog post about how the Damn Fine Words course could change your life, and what you would do with the writing skills you learn. You could write about how becoming a better, faster writer would literally change your life – and if you do, tell me specifically how it would change your life, and what you would do to create even more change. You could write about how a lack of confidence about your writing has affected your business – and if you do, tell me specifically how it has affected your business, and what you would do if you had your confidence renewed. You could write about what it would mean to have your writing obstacles swept away forever – and if you do, tell me specifically what you’ll do when those obstacles disappear, and how having them gone would make your life better. Write about why it’s important for you to be in the Damn Fine Words writing course, how it could change your life, and why that’s important. Your entry should be at least 600 words and less than 1,500 words. Your entry needs to be specific, so pay attention to the little details. Your entry must be posted or published to a public location where I and other constants can read it. No private entries will be accepted. After publishing your entry, come back to this post and leave a comment that links to it. No points are given for proper grammar or spelling. No points are given for fancy words or brilliant prose. No points are given for the quality of writing at all – that’s not being judged. I’m looking for people who want to commit to learning better content-creation skills so their business has a better chance at success. I’m looking for people who are driven to succeed and who understand that better writing skills could take their business to the next level. I’m looking for people who are willing to show up and learn – people who are ready to dedicate themselves to their self-improvement. I’m looking for people who want to squeeze this course for every ounce they can so they can take action and put their new writing skills to good use. You don’t need pretty language or fine writing to convey that. Trust me – I’ll see it. The Damn Fine Words writing contest closes on January 27 at midnight, eastern time zone. When the contest closes, I’ll read every entry and select a winner and runner-up. I’ll contact all entrants by email, so be sure you have a functional Contact page on your blog or website, or let me know how to get in touch with you by email.